Brassidium Orchids – These Are Beautiful “Spiders” in a Beautiful Display! Jamie put together this stunning display the other day at the front of the shop, using a beautiful mix of containers and plants. 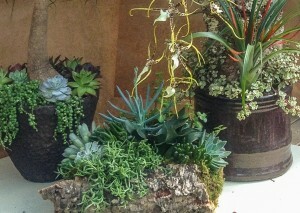 The picture doesn’t do her designs justice,,,a pony tail palm underplanted with succulents; another succulent planting in cork bark; and a gorgeous arrangement of a standing cork bark planter with brassidium, or spider, orchids. This closeup picture of the succulent plantings shows both the diversity of this group of plants and why we enjoy working with them so much. In addition to the drought tolerant ponytail palm, there are echeverias, string of pearls, string of bananas, crassulas, and variegated trailing jade plant, all right at home in her design. The spider orchids are so exotic looking with their long, long stems holding spidery-looking flowers all along their length. These flowers actually evolved to attract a certain female parasitic wasp that lay their eggs on spiders in their webs. Since the flowers look like spiders, The wasp lays the eggs on the flower and is covered with pollen. Not getting the spider it’s looking for, it moves on to the next “spider”, thus pollinating the plant. Pretty amazing stuff. As I’ve pointed out in other posts, the key to figuring out how to grow a plant is finding out where it’s native habitat is, and a previous post on bromeliads highlighted this. 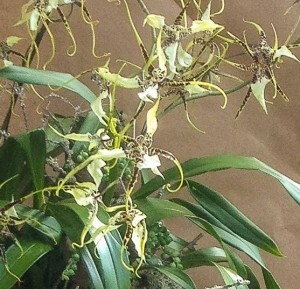 Brassia orchids are native to wet, tropical forests of Central and South America. They are named for the 19th century British botanical illustrator, William Brass. Orchid hybridizers have crossed Brassias with Miltonia and Ondontoglossums to create some incredible hybrids, many of which are fragrant and have very large, spidery flowers. They require very bright light but not direct sun. Please don’t expect them to be happy in a dark, interior room! In the tropical forests they receive diffused light through the trees. Keep your Brassidium orchid moist during the growing season. This is the period when the pseudobulb develops and flower spikes appear. After this period, when in flower, don’t overwater; the fat pseudobulb at the base is helping hold moisture. Water once a week or when the pot begins to feel light. Brassidium orchids appreciate humidity, temperatures between 65F and 75F during the day, and good air circulation that can be provided by a fan. Since our homes tend to be dry, if you’d like to keep your brassia happy, add a shallow tray of pebbles in water that the pot can sit on (but not in the water). This will help raise the humidity to the 50%-70% these orchids prefer. 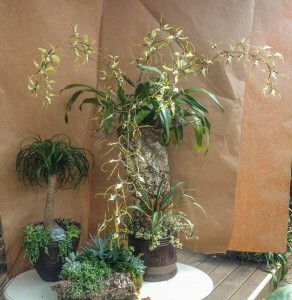 This entry was posted in Container, Flowers, Indoor landscape, Indoor Plants, Orchids, Succulents and tagged brassia orchids, brassidium orchids, crassulas, echevarias, orchid arrangements, orchids, pontytail palm planted with succulents, ponytail palm, rhipsalis, string of pearls, string of pearls succulent, succulents, succulents in containers, trailing jade plant on May 31, 2014 by Kris Blevons.